I grew up loving the Pacific and Atlantic Oceans. I lived in a little beach town in Massachusetts for part of my childhood, and my family spent a lot of time at and in the water. No matter how cold the water was or how huge the waves were, my brother and I loved bodysurfing. The waves could slam us down onto the sand and drag us, and we’d go right back in. I loved everything about the beach: the salty smell, the sound of the waves, and the feel of the sand, the rocks, and floating in the water. I loved exploring and swimming but could also just sit there and let all my senses take it in. I have always been in love with the beach. 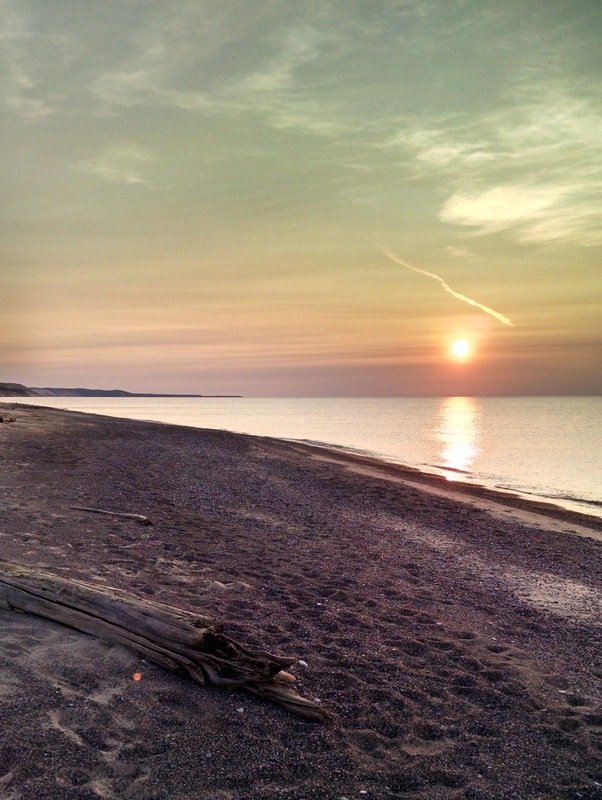 So when I moved to Michigan in high school and people said lake beaches were great beaches, I scoffed. A lake can’t be a beach beach, I said. A few years later, I saw the Chicago side of Lake Michigan, and the lake itself was beautiful, with the shiny city skyline perched alongside it. But the beach area I saw—just a stretch of sand and water--was unimpressive. So I still wasn’t convinced. I didn’t doubt that the Great Lakes were gorgeous, but I doubted that lake beaches could have the feel of beach beaches. 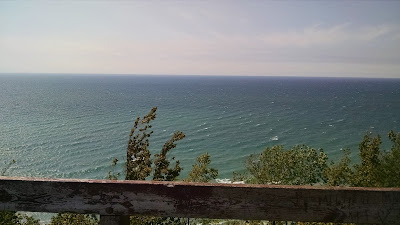 Then, this summer, we took the long way back from Traverse City on a windy day, over to the west side of Michigan on Lake Michigan. We saw a sign for a lighthouse down a road, so we turned—and found swirly blue and white waters crashing onto the shoreline, slapping the breakwater at the base of a red and white lighthouse. Our second stop was a turnout on the highway at the top of a big hill—we came around the hill and saw a dark teal expanse of water down below, and I had to catch my breath. It was stunning. 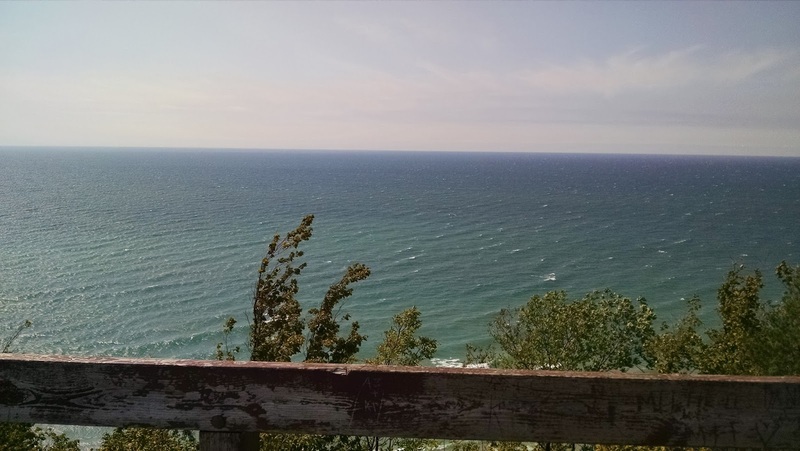 We got out and climbed higher onto a lookout point, and the bright blue waters extended as far as you could see in either direction, with curved cliffs in the distance and neat rows of waves hitting the shoreline far below. It looked like the Pacific Coast, and it was much bluer than I’d imagined. This week was my first trip to Lake Superior. First, I saw it in the distance—an azure gap between tall trees—and then, when we drove up, the beach was hidden by dunes with grasses growing out of them, which reminded me of North Carolina's Outer Banks. When we got over the boardwalk and onto the beach, my kids ran off and started dipping their toes in the water, picking up rocks, and playing in the sand—exactly what my brother and I did the second we hit the beach. The sight of my kids doing that hit a sentimental nerve. And the beach was gorgeous, on a macro and a micro scale. There was a diverse mix of types of rocks, including bright reds, greens, and glittery golds, and some rocks with all those colors woven together. The four of us kept finding interesting rocks to show each other. 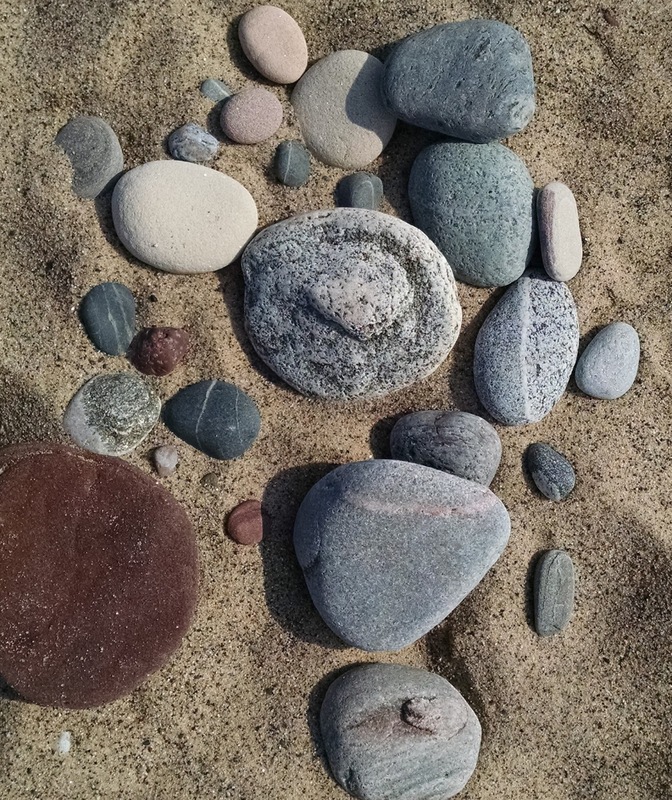 In Massachusetts, we would hunt for wish rocks, which have a band of a different color all the way around--a layer of a separate type of rock wedged into the middle. They fascinated me as a kid. Here, on Lake Superior, they were everywhere. A curve of cliffs sat along one side of the shoreline in the distance. It was not very warm while we were there, but I didn’t want to miss swimming in Lake Superior, so I plunged in. It was freezing but exhilarating, and after swimming, I helped my daughters find more rocks and build sand castles, and I let my dog swim. We watched the sun set over the water. There was no salt anywhere, and no surfers, but everything else about the experience was like an ocean beach. We also took a cruise along Lake Superior’s Pictured Rocks National Lakeshore, which is a colorful display of layers of rock that looks like it was just sliced into at the edge of bright blue-green water, and with a forest on top. After Lake Superior, we headed south to the lower edge of the upper peninsula, where I kayaked on an inlet of Lake Huron. The water was too cold for me to submerge myself in this time, but I got to navigate through tall grasses and around islands and sailboats. That evening, mist rolled in from the Huron and blanketed the shore. So I was wrong, Great Lakes. I’m sorry. You’ve made me a fan, and you haven’t seen the last of me. Alison, Your post is a fitting tribute to one of Michigan's greatest assets. 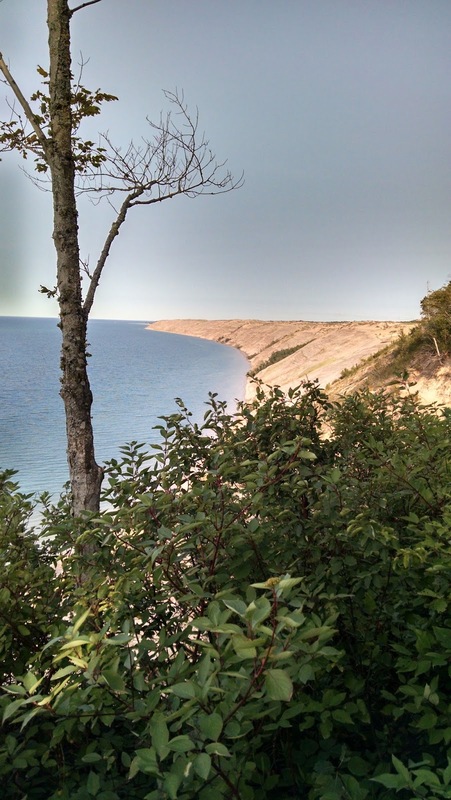 Sleeping Bear Dunes puts the awe back in "awesome." My experience was the reverse of yours, with the same conclusion. I visited SBD and Michigan's Great Lakes at an early age, then Carmel, then Cape Cod. The ocean beaches struck me as very nice, but not as great as MI Great Lakes. thank you! So many things to like about both areas. yes! And I'm glad to hear I'm not the only one.